A man sentenced for organizing the murder of liberal politician Galina Starovoitova in 1998, has reportedly named the mastermind behind the crime. ­Duma deputy and ethnographer, Starovoitova was gunned down at the entrance of her house in St. Petersburg in 1998. 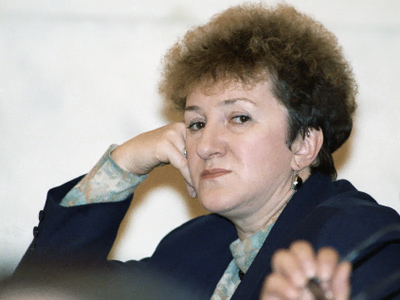 She was known as a close ally of the former President Boris Yeltsin, defender of democratic reforms and a staunch supporter of ethnic minorities’ rights. Since that time, journalists and investigators have put forward numerous versions as to who could have been behind the murder of the liberal politician. On Friday, Fontanka.ru website said that Yury Kolchin, a businessman linked to a St. Petersburg gang, had fingered Mikhail Glushchenko, a former Duma deputy with Liberal Democratic Party, as the man who put out the order to assassinate her. Starovoitova supported Yeltsin until the first Chechen war started in 1994, when the president decided to send troops to the rebellious republic. Prior to this she served as the presidential adviser on interethnic issues and was even once proposed by liberal politicians to the post of the defense minister. She supported Armenians in the Armenian-Azerbaijani conflict over the Nagorno-Karabakh region. Starovoitova attended international congresses and met with such world leaders as Margaret Thatcher and Jacques Chirac. She co-chaired the Democratic Russia Movement and was a fellow of the Washington-based US Institute of Peace. In 2005, Yury Kolchin was sentenced to 20 years for organizing her assassination. Vitali Akishin, charged with firing at the politician, got 23 years. Three other people are still being pursued by the investigators. The media has long described Glushchenko as the main suspect in the case. But there had not been evidence against the man, and Kolchin, his acquaintance, denied Glushchenko’s involvement. In 2008, the investigation was suspended – only to be resumed the next year when the former Duma deputy was detained. A week ago Kolchin changed his mind, anonymous sources told the website. Glushchenko was a member of the lower house from 1996 to 1999. Last week, he admitted to organizing the murder of St. Petersburg businessman Pavel Kapysh in 1999, Kommersant daily reported. Investigators also accuse the former deputy of racketeering, and murdering three Russians in Cyprus along with other crimes. Investigators have now for the first time received evidence regarding Glushchenko’s involvement in the Starovoitova case. But sources in law enforcement agencies described Kolchin’s testimony as too short and lacking details. Meanwhile, Glushchenko himself is reportedly refusing to co-operate with investigators on Starovoitova and even reversed his earlier testimony. Still, facing a trial for numerous crimes, Glushchenko “in the near future may agree on a deal with the investigation,” Fontanka.ru said. Despite this new turn in the Starovoitova case, Glushchenko’s possible motives are not clear. The media reported on his alleged link to the Tambov criminal group in St. Petersburg. Head of the Investigative Committee Aleksandr Bastrykin said a year ago that the investigation of the crimes committed by the gang “will be completed and all its members will be punished."